Mary Jane still isn’t settled into New York City, and we’re still not settled with the splitting between Mary Jane’s and her Atlanta family’s storylines, which added some of the best moments in the past season. 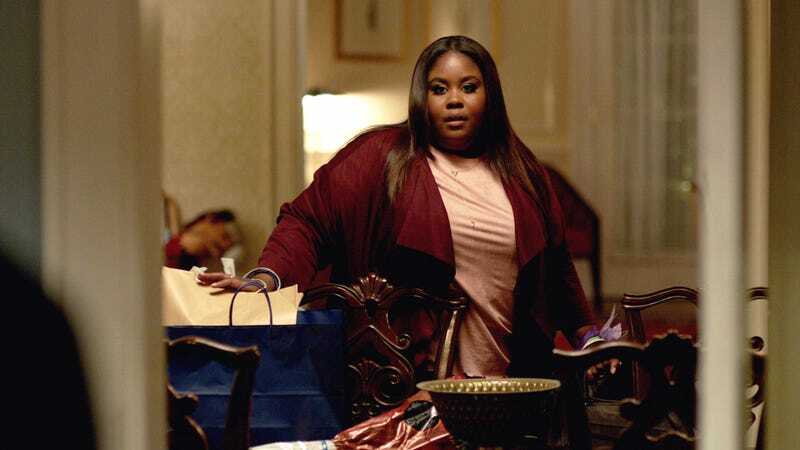 It is great to see the family back in this episode of Being Mary Jane, even if Niecy hasn’t matured much. Last season closed out with a cliff-hanger that sucked the air out of the room: A police officer used a Taser on Niecy during a traffic stop—for what? Well, as the all-too-familiar story goes, there was no legitimate “what” or reason, but a citizen, when black, always loses to the will of the police. We fast-forward to this season, where Niecy’s story is hurriedly fast-forwarded to her accepting a settlement from the police department. With Mary Jane being in New York City, the opportunity to explore more of the intricacies of the black family experience are stilted. That includes the nuances of dealing with the fallout from police brutality. But we do get to keep on keeping on in dealing with Niecy’s disinclination toward maturation. One-hundred-and-fifty-thousand dollars sounds nice. I would accept it graciously and proceed to pay to unlock the albatross named Navient that is chained around my neck. Run and buy a brand-new car for me and my part-time baby daddy? Not so much. Pop wildly overpriced bottles at the club before setting up a trust for my kids? I don’t think my eyes can roll far enough back in my head. Immature folks do immature things, including allowing a stranger to provoke them into a fight. Calling security wasn’t an option? Oh. At least Niecy snatched ol’ girl’s quick weave off. Mary Jane and Paul Jr. share plenty of bonding time since M.J.’s beau, Lee, is out of town. M.J.’s going through one of the realest of New York City experiences: being lonely in a city of 8 million people. So to counter that loneliness, she and Paul Jr. spend the bulk of the episode attempting to cook their father’s ribs and homemade barbecue sauce on the balcony of M.J.’s $1,000-a-night hotel room, which ends in obvious failure. We’re still being set up to see where P.J.’s relationship with his mentor and her daughter is going. That child is too white and angelic-looking to not be devilish. To get an interview at one of the most prestigious morning shows and then walk out with a bottle of alcohol that you lifted from an anchor’s office ... what kind of Taylor Swift, white-woman privilege? All her life, M.J.’s mom, Helen, just wanted to be a prim-and-proper black woman who wears her pearls and does bougie, Talented Tenth things with her homegirls. And every time, she has to fight the air and a woman in a bad wig because her offsprings’ reputations and missteps proceed her. This go-round, Helen is looking forward to having D’Asia inducted into Jack and Jane. Much like the real-life Jack and Jill, the great benefits of the program come with a strong dash of classism and respectability politics. With Niecy’s fight being on the World Wide Web for all to see, Joan, who had previously agreed to endorse D’Asia for membership, backs out. Joan falls back on the most blatant and obvious “But what does she come from?” line of classism, associating D’Asia with her father Patrick’s battle with drugs and sister Niecy’s fighting, as the reason D’Asia is unacceptable for membership in Jack and Jane. Helen gives a “You know I know your dirt” monologue to the J and J mothers, which gets two of them to stand up for Helen while revealing their own family secrets. Passing on wealth is notoriously hard for black families, and each lady was struggling through an aspect of it. I just wish their wigs weren’t struggling with them. What was obvious from the beginning of the episode, with Niecy fighting the girl with the Milky Way quick weave, was that there was going to be some major consequence connected to her settlement. But it wasn’t the fight that did Niecy in; it was her clapback on Twitter the day after the fight hit the internet. Did Niecy not get a lesson in the futility of fighting internet trolls? This is round two of a lesson she should have already learned, especially when there is money connected to her keeping her mouth shut and her thumbs still. Because she mentioned her case against the cop in a tweet, Niecy broke the settlement agreement and was forced to return the $150,000, which she had already spent the bulk of. Much of Niecy’s storyline is obvious before it even happens. We knew Niecy’s buying Dante a car earlier this season was going to go nowhere but straight toward false expectations, hurt feelings and another woman. We knew that, but Niecy didn’t until she went to take back the car and found Dante’s second baby mama driving said car. Since everyone got a monologue this episode, the other baby mama gave a guilt-tripping soliloquy on being a single mother with no family to support her. We’re gonna pray that Niecy caught the hint of how fortunate she truly is, even amid the criticism her family gives her. But oh, how sweet the sound, to hear Niecy tell Dante to never call her for anything outside of their daughter and that he can go play Rufio of the Lost Boys with some other unfortunate woman. Her son, Treyvion, is coming of age and deserves to see his mother make better decisions. Maybe that will come in the near future. YouTuber, author and feminist, a #SmartBrownGirl who loves tacos, culture and critical thought. You can find Jouelzy on YouTube at the intersection of pop culture, history and politics.